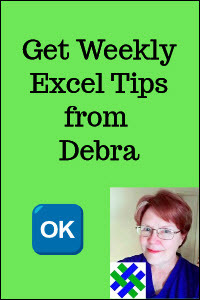 Add Excel comments to worksheets cells, to explain the contents, or to offer tips to users. 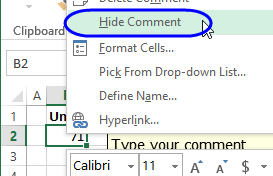 Note: Threaded Comments are being added to Excel, and some Legacy Comment features are not available in Threaded Comments. Right-click the cell in which you want the comment. Type your comment where the cursor is flashing. Text will wrap automatically. If you want to start a new line, press the Enter key. Note: All comments in all open workbooks will be displayed. To hide the comments, click the Show All Comments command again. 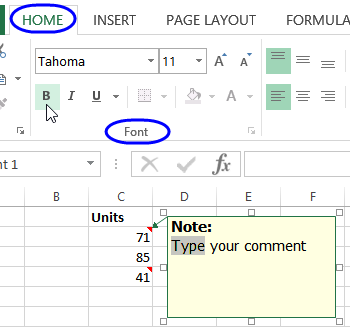 You can change the font, the font size, font colour and font style, for all or part of an Excel comment. To format all text, click on the border of the comment shape. To format specific text within the comment, drag over the text to select it. When finished, click outside the comment box. Show specific comments or all comments. 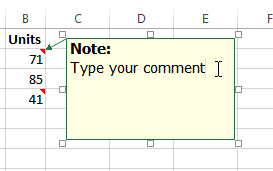 On the Sheet tab, from the Comments dropdown, choose 'As displayed on sheet'. On the Sheet tab, from the Comments dropdown, choose 'At end of sheet'.